This has been brewing for a few years, but it has a great back story. In Nov 2012, Victor Briestensky stole the existing park district sign for Guelph Park and erected his own duplicate sign. 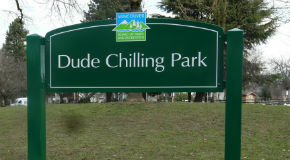 As I recall, he initially kept quiet about it until “Dude Chilling Park” showed up on Google Maps. The Parks Board wasn’t amused and pulled down the original sign. There was a fair amount of publicity and notoriety after this, with even some talk of officially renaming the park. In Mar 2014, the Parks Board compromised and kept Guelph Park, but installed a new, donated, sign as a piece of public art. The Parks Board has a good summary and includes several interesting background documents. Inside Vancouver has pretty much the same story, but written a bit more colorfully.